The brand spanking new Disneyland in Shanghai, China is pretty amazing. 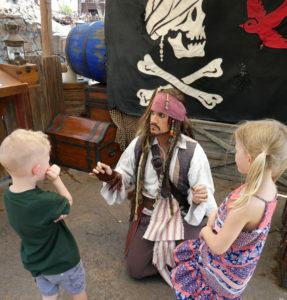 You can read about our thoughts about the Disneyland park as a whole, but this post is just about the new Pirates of the Caribbean: Battle for Sunken Treasure Attraction. It is worth every penny you possess to go ride the new Pirates of the Caribbean attraction. In fact, they should immediately shut down every existing version of this ride as they are an embarrassment to Walt Disney himself. No, really, of course they are classics and have charm and nostalgia, but the new Pirates ride is the future of Disney and the future of all theme parks, so it’s fitting that the future of Disney is located in the city of the future. Asking if they know where Davy Jones is, and if they can get him some treasure. This new ride is still on a boat, and it’s still on a river, the line winds its way through the treasure of Tortuga and it still opens outside a restaurant, Barbossa’s Bounty Restaurant, but that is where the comparisons stop. First off, you need a lap bar (it’s not entirely necessary, but it sets the tone), and the boat you are in is huge, (this also sets the tone) which most importantly moves a lot of people through the ride quickly. Take the time to wait to sit in the front row, it makes all the difference. 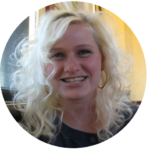 Your children may have a hard time seeing otherwise, and you want an unimpeded view. We happened to sit in the front row on our first trip and it was enthralling. The second time we didn’t and were straining to see and try and find a good vantage point. The next few times we waited for the front row. Yes, you could spend your entire day at Shanghai Disneyland riding the Pirates of the Caribbean: Battle for Sunken Treasure attraction and never get tired. 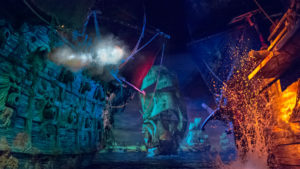 This new pirates ride takes you through several stages some of which you find yourself submerged underwater, floating through the wreckage of no less than 5 destroyed full size pirate ships, including the Flying Dutchman, front and center to witness the kraken, meeting Davy Jones himself, and clocks in at just about 10 minutes long. The immersive nature of this ride is unparalleled. The giant IMAX screens deliver an experience that you can’t shake. The rising and falling of the tide, the lapping water, the mesmerizing weather. Yes, it’s like Mt. Everest, it creates its own weather!! There is no escape. Check out what we thought of the entire Shanghai Disneyland theme park, and our ranking of every Disney park across the world! ► For Kids: There are no height or weight requirements or restrictions for this attraction, so the whole family can enjoy. It’s dark, but it’s not scary. It’s got all the fun and magic that the movies possess, and more! This is like watching a short movie that you are a part of. 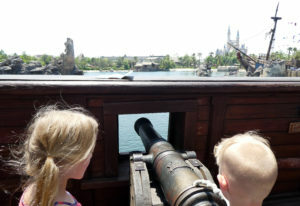 Kids will think they are actual pirates fighting alongside Captain Jack Sparrow! Have you ridden the new Pirates of the Caribbean: Battle for Sunken Treasure attraction? Let us know what you thought in the comments. ► Nap-time Version: The new Pirates of the Caribbean ride is incredible. Definite must do at Shanghai, Disneyland regardless of the wait time. Lines move fast, and the ride clocks in at 10 minutes long!